I didn’t get many detail shots of our grain-free Thanksgiving dinner this year, but it wasn’t especially fancy, just tasty, high quality food. Jeremy and I are both getting over a stomach bug, so we didn’t have huge appetites. I was most proud of the fact that I managed to have the whole meal ready at the target time of 2:30pm, much earlier than we have historically eaten Thanksgiving dinner. 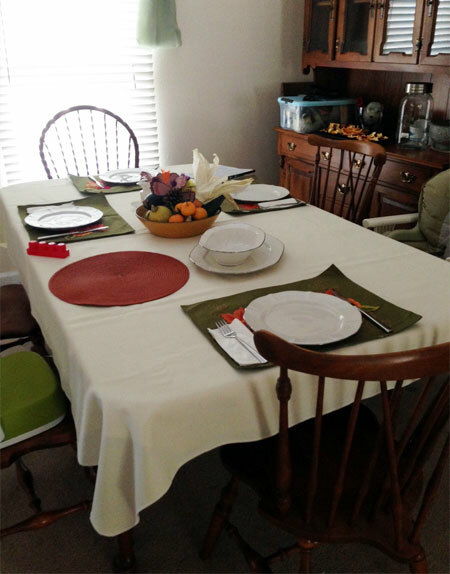 This year was also special in that it was our very first holiday meal together at this dining room table, which traveled all the way from my grandma’s house in Ohio last month. Very much like last year, I slow-roasted a 15lb organic heritage turkey, rubbed under and over the skin with thyme, sage, and shallot butter. It was in the oven for 14.5 hours, and came out a perfect mahogany brown. 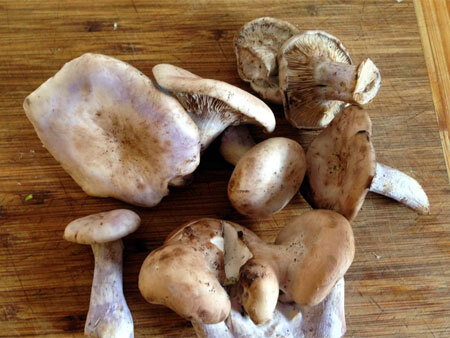 Drippings went into a basic chanterelle mushroom gravy. Bread cubes drying, leeks melting, and bowlfuls of cleaned, chopped, minced, and/or boiled vegetables – almost showtime! This year’s sides were largely prepped in advance, so that I could just put them together and warm them up once the turkey was out of the oven. I got a bit of a late start on the prep this year, as I usually start with the baked goods on Tuesday. On Wednesday afternoon, I roasted and peeled a tray of chestnuts. I also baked a loaf of grain-free bread and diced it up to dry for stuffing. 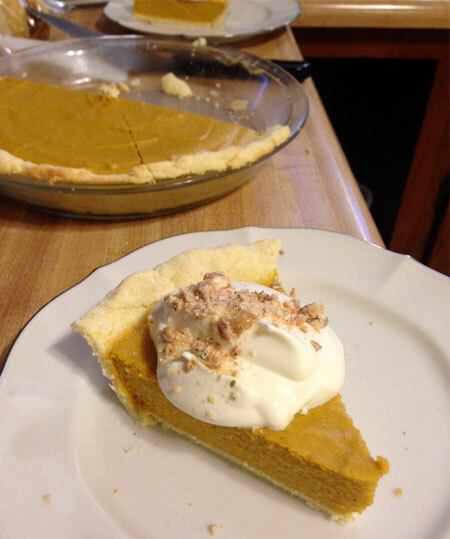 Finally, I put together a pumpkin chiffon pie, roasting a whole sugar pumpkin and trying my hand at a paleo pie crust. 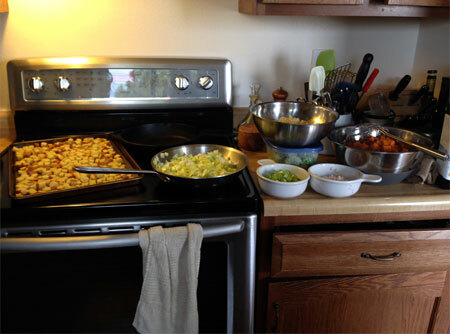 On Thursday morning, I did all the side dish prep. I successively boiled Brussels sprouts, sweet potatoes and cauliflower, and saved the cooking liquid to add to the turkey stock pot later on. Then I cleaned and chopped all the other vegetables for mise en place. I also melted two huge leeks in butter, browned up some maitake mushrooms to garnish the cauliflower, and cooked down the obligatory potful of cranberry sauce with diced Fuji apple in time for it to gel up in the fridge. Once the turkey came out of the oven at 2pm, it was just a matter of assembling the various sides. I mixed up a basic leek, mushroom and giblet stuffing with the grain-free bread cubes, using somewhat exotic bluefoot mushrooms just for fun; it baked in the oven with a small batch of paleo dinner rolls that were mostly for Nolan’s sake, since he no longer eats purees, stuffing, pumpkin pie, or even much in the way of turkey. The sprouts went in a saute pan for some color, and were finished with a handful of chopped chestnuts and a splash of maple syrup. The sweet potatoes went through the food mill courtesy of Jeremy’s assistance, and then heated through with some cream and the aforementioned melted leeks. I threw the cauliflower in the food processor with some stock, sour cream and Parmesan, then warmed it in a pot with the maitakes stirred through. 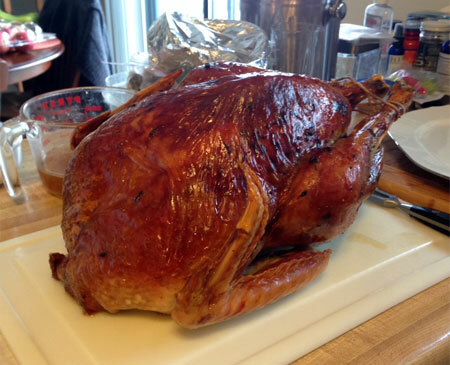 The turkey was gorgeous and very moist. I promptly broke down the carcass and started up batches of stock in my largest pot and also in the VitaClay (which is so small it could mostly just hold the wings and some veggie trimmings). The sides were all tasty as well. I thought the grain-free bread held up admirably, and made a dish that was indistinguishable from regular gluten-laden stuffing. I probably wouldn’t bother baking grain-free bread frequently, since it was still mostly arrowroot starch, but for a special occasion meal, it certainly did the trick. I thought the sweet potato and cauliflower were both delicious, although I strongly suspect that I will be getting the cauliflower leftovers all to myself, and I am already considering converting it into a soup for my lunches. The Brussels sprouts were tasty as well, although I didn’t use as much maple as the original recipe called for. The dinner rolls were really the only disappointment, but they were a last-minute choice after discovering the grocery store was out of chestnut flour (I had planned on a yeasted chestnut flour roll based on a recipe I played with a few months back). Finally, as mentioned above, the pie was tasty but didn’t have that super-fluffy chiffon texture, and the crust was rather bland. I mostly wish that we had managed to get more than a single bite of turkey into Nolan; his Thanksgiving dinner was mostly the same old cheddar cheese and Zing bar, which is such a bummer. We have a bounty of leftovers this year, as I made bigger batches of side dishes specifically for that purpose. I’m planning to make a big pot of turkey soup to take to my parents’ house this weekend. The only dish that is already disappearing too quickly is the pie, mostly because my mom talked me out of making the salted caramel apple-hazelnut tartlets that was going to be my second dessert offering. And since I still have quite a few chestnuts to use up (both ready-roasted and still in the shell), I am currently eyeing this grain-free chocolate-chestnut mousse cake as a Thanksgiving encore—I even happen to have three orphaned egg yolks in the fridge from making the stuffing and pie! 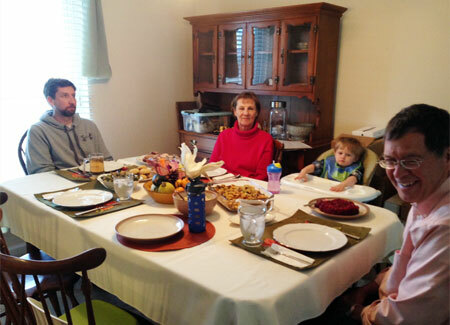 The table all laid out courtesy of my mother – the only thing it was missing was more family and friends!